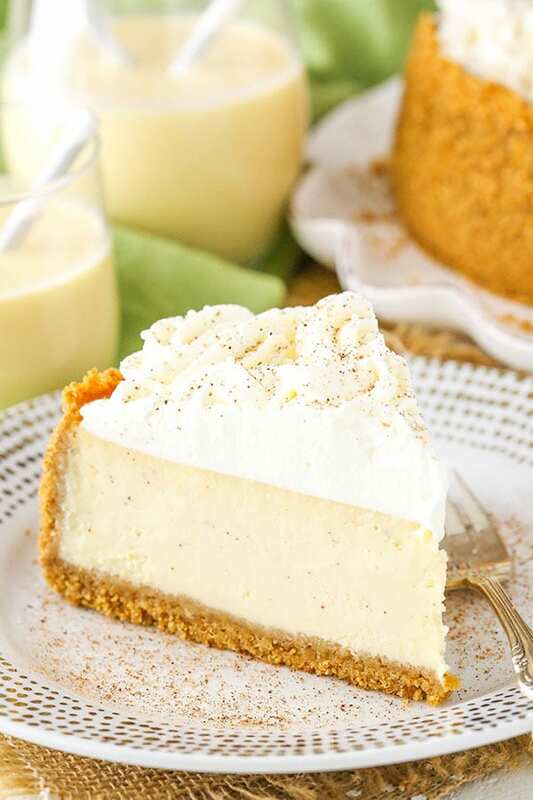 This Eggnog Cheesecake recipe is thick, creamy and full of eggnog! Perfect for the holidays, it’s a delicious way to enjoy one of my favorite drinks of the season and was a huge hit! One of the best things about the holiday season is giving back. One thing I love is that every year our church gives back to so many organizations in our area and around the world. Between collecting donations, giving time by volunteering at organizations in the area and donating to food kitchens in the areas, it’s a wonderful thing they do every year. So I’m also excited to be partnering with the ADA Mideast for their holiday campaign. They’re donating 25 cents, the average cost of 1 glass of milk, to the Great American Milk Drive for every new follower on Facebook, Twitter and Instagram through Wednesday, Dec. 13. Milk is the number one nutritious product requested by food banks, but it is rarely donated. The Great American Milk Drive is delivering thousands of gallons of milk to families who would otherwise go without. How great is that? Nutritionists recommend 3 servings of milk a day, which is about a gallon each week, but 46 million Americans – including 12 million children – only get on average 1 gallon of milk ALL year. Of course if you’d like to give separately, you can do that here too. A $5 donation gives a gallon of milk to a family in-need. On top of the cheesecake is some eggnog whipped cream, because is there such a thing as too much eggnog? I think not! I piped the whipped cream onto the cheesecake with an Ateco 844 frosting tip, but you could also use the Wilton 1M or 2D to get a similar look. Sprinkle on a touch more nutmeg and a few pearl sprinkles and you’re all done and ready to dig in! 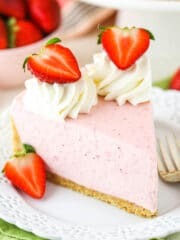 I shared this cheesecake with lots of family and friends and it was such a HUGE hit! Some were getting a little protective over it and I thought perhaps someone might throw down over the last piece. 🙂 I hope you love it as much as we all did! 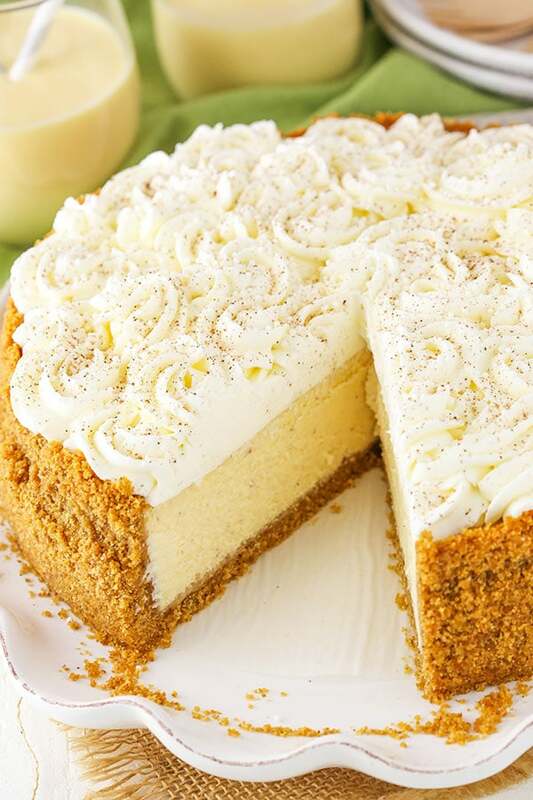 This Eggnog Cheesecake recipe is thick, creamy & full of eggnog! A delicious way to enjoy one of my favorite Christmas drinks & celebrate the holidays. This looks fantastic! I love eggnog, and especially the light flavor it lends to baking. I hope you are well and you had a wonderful Thanksgiving! I also love eggnog and this recipe is amazing! You take it out after chilling, before adding the whipped cream. Sorry that was unclear. I’ve updated the instructions. To remove it, you unhook the latch on the side of the pan and pull the sides off. I usually rest the cheesecake on my hand and lift the cheesecake up and pull the sides down. I hope that helps. I have a spring form pan and but the bottom part is missing. I. Can’t find it and I don’t know what happened to it. Can I make this in a normal Wilton deep 9 inch cake pan? Will it still slice ok? It might be a little hard to remove from the pan, but otherwise it should be fine. I did not notice the plastic bag until after I put it in the oven. I hope it’s not soggy. 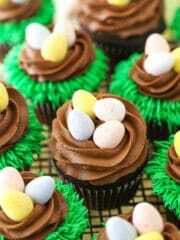 I taste the filling before adding the eggs and its delicious. Currently in the oven with heat off. 10 minutes left. Can’t wait! Thanks for this recipe. I haven’t tried it, but usually cheesecakes are fine when frozen. Wondering if spiked eggnog is used, does that change the bake time or impact the cheesecake itself. 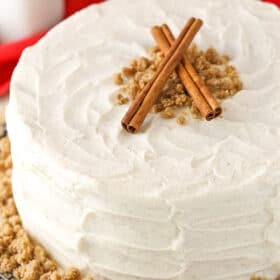 IF adding RUM or BRANDY (how I like eggnog drink) to the C–cake, would you suggest decreasing some EGGNOG and ADDING the liquor to equal ONE CUP (eggnog) liquid ? Also…I care NOT for Graham Cracker crusts…and would use “pulverized ” flavored cookies, dust the pan ith that after lightlt buttering the pan interior, before adding the cake batter. worth a try !! New York Style Cheesecake is like that. 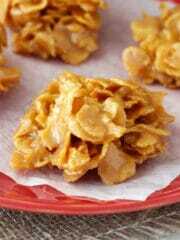 Or, crumbles the cookies and follow directions same as Graham cracker instruction. You could certainly decrease the eggnog a bit, but you wouldn’t want to decrease it too much or you’ll lose some of that flavor. You can add a little more liquid to the cheesecake for the rum or brandy, you just might need to bake it a touch longer. 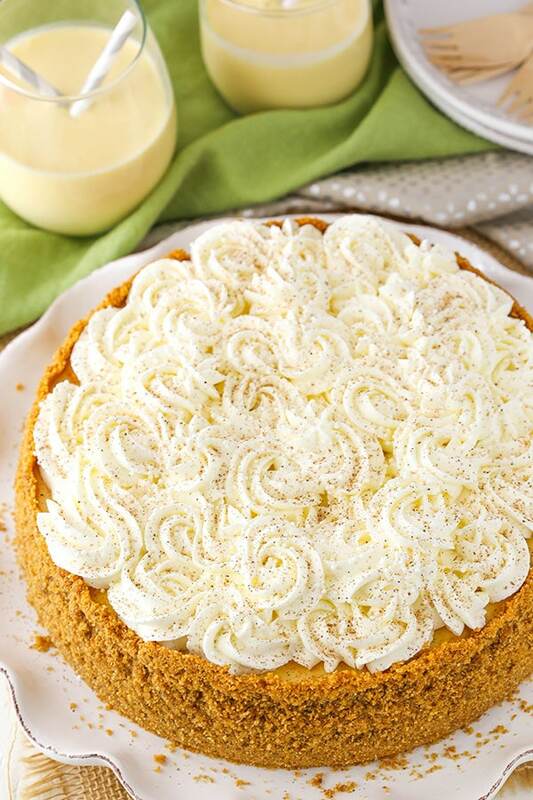 I’ve used 1/2 teaspoon rum extract in a no-bake eggnog pie, and it worked quite well. Was thinking about trying that in this recipe. Your recipes are the best. Your directions and suggestions make cooking simple with fantastic results. Your recipes have made me a better cook with greater understanding. Everyone loves what I bake from your site. I cannot say enough good comments. You made a believer and pasty chef out of me!! Thank you for sharing and caring enough to share your talented gift. Will the eggnog taste be noticable? Will the taste of the cream cheese overpower the taste of the eggnog? Yes, it’s definitely more than noticeable. However, it you want a really strong eggnog flavor, you can increase the eggnog to 1 1/2 or even 2 cups and then cook it down on the stove to 1 cup and add it that way. 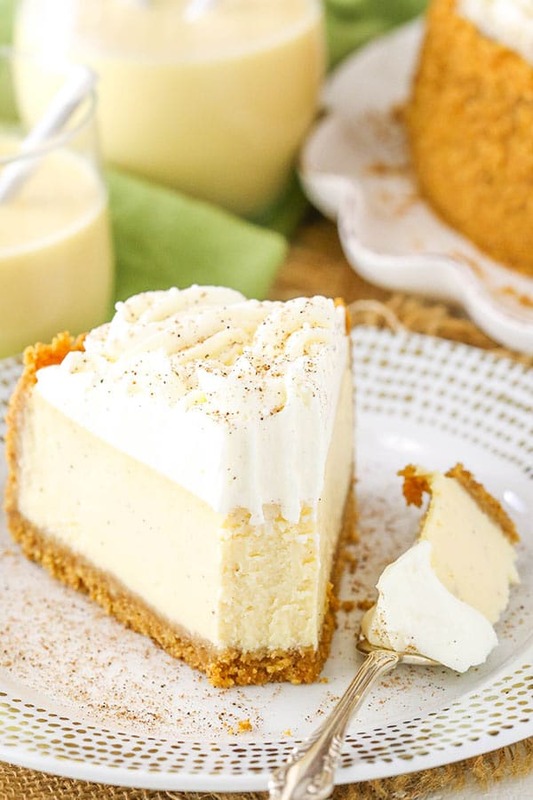 Then you’ll have the same amount of liquid being added to cheesecake (so baking time and such shouldn’t change), but the flavor of the eggnog will be more concentrated. When you say remove it from the oven and chill it, do you mean just sit it out or chill it in the refrigerator? It should be chilled in the refrigerator. Can I make this in a pie dish and not cook with the water around it? I wouldn’t suggest a pie dish, only because I think there’d be too much filling and it’d might overflow. The water bath is important, in my opinion. 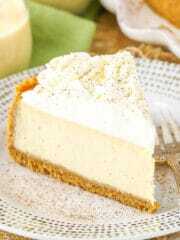 Without it the cheesecake usually browns around the edges, falls in the center when cooling and often cracks. Can u use a Graham cracker crust instead of making one. Would it change cooking instructions. A store-bought crust should be fine. You’d just need to look at the instructions to see if you need to pre-bake it before adding the filling. Also, if it’s a pie crust, there could be more filling than you need. I use the premade crusts for my pumpkin cheesecakes. The filling is normally more than I need for one crust so I buy the mini ones as well and use the extra filing in those and give them out. I’m considering using your recipe as a bite sized version for one of our Holiday desserts. If using a mini muffin pan, what would you suggest as the baking time? Also would a water bath apply as well? Your recipe is the best I’ve seen so I’m excited for the end result! I would suggest cupcake sized ones, not minis. I’m not sure of exact bake time, but it should be similar to other minis like these, with the baking and cooling time. You wouldn’t need a water bath. I hope you enjoy them! Can this recipe be used to make it into mini cheesecakes (i.e. cupcake sized)? Yes, it’d be fine as minis. Thank you for the perfect recipe! 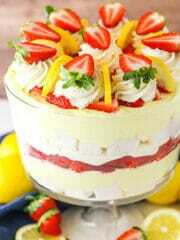 Very beautiful cheesecake. Do you think the filling would be okay using gluten free flour? Yes, I think that’d be fine. This was the first time I tried the water bath method but never again. The water found its way through the foil and now the bottom of my cheesecake is soggy. It’s definitely frustrating when springform pans leak. I’ve only ever found one that didn’t. I have a tutorial here for helping solve that problem. As for this particular cheesecake, the crust should dry out and be just fine. Do you take the cake out of the pan before or after you put the whipped cream on? Also can the whipped topping go on a day or two before or should it be right before serving? Take it out of the pan before adding the whipped cream. It can be added a day or two in advance, just be sure to use the full amount of powdered sugar in the whipped cream. It stabilizes it. 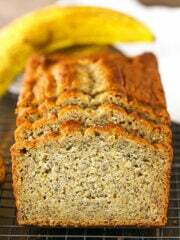 Can i make this gluten free by substituting corn starch for the flour? Looks yummy! You could just leave the flour out. The cheesecake will be a touch denser, but it’ll be fine. I accidentally used 16 ounces of cream cheese instead of 24. I have been baking over 25 years, I feel dumb. I realizes what I did 10 minutes into baking and figured it is to late to fix. Should I keep baking of just scrap it ? Hmmm, not sure. It would probably bake, just be a little different and not as thick of a cheesecake. When do you remove the pan? After the big chill? Yes, after chilling. Sorry that was unclear. I’ve updated the instructions. Yes, I buy it in the grocery store right by the milk. The cheesecake recipe turned out great, but I can’t get my whip cream thick enough to pipe a design on the top. This last time I added more powdered sugar, dry milk powder, & whipped on high for almost 20 min, but it’s still runny. Any advice? I’m not familiar with using dry milk powder. But what kind of whipping cream are you using? Is it heavy whipping cream or just heavy cream? The heavy whipping cream would be better because of the higher fat content and get thicker. Otherwise I’m really not sure what would cause it to not thicken. I want to make this recipe for Christmas as it looks amazing! I live in the U.K. & eggnog is very hard to find. Have you tried making your own eggnog for this recipe? I’ve made eggnog before just to drink & it isn’t as thick as the store bought kind is. Do you think homemade eggnog will work in it? Any tips you could give me? Homemade eggnog should be fine. It’s possible that you might want to add a touch to the baking time if it’s super thin, but it should be fine. I just tried this recipe and fell in love! Thank you for adding to my collection of delicious cheesecakes!! Can you use store bought eggnog in this recipe? Mine is in the oven…I’m at the ‘turn oven off and keep it in there for 30 minutes. I can’t wait until it’s done. It’s going to an office Christmas party tomorrow. Unfortunately, I’m a bit (a lot) nervous about using fresh whipped cream. So I’m going to ‘alter’ a bit and pick up some (blech) Kool Whip. 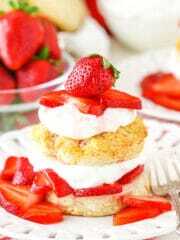 Next time, when the cheese cake can stay at home with me, I’ll do it right! I’m still really excited about cutting into it. Thank you for sharing this recipe. 🙂 Merry Christmas! I hope you enjoyed it! Merry Christmas! does this really take 24 oz of cream cheese seems like a lot? Can you use homemade egg nog for this recipe? 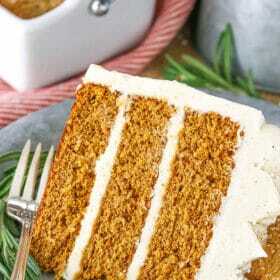 Am making this cake now to serve Christmas day. Hope it comes out good. Can’t wait to try it. Looks delicious. Would any fruit sauce or chocolate layer taste good under the whipped cream? It certainly could! Totally up to your preference. When I put the whipped cream on top, will it still be good a few hours later? In other words, does homemade whipped cream deflate over time? Sounds so yummy!! Just be sure to use the full amount of powdered sugar (which helps stabilize the whipped cream) and it should be fine for several hours (or days, when refrigerated). I hope you enjoy it! What other type of pan can be used for the water bath? Any pan that is large enough to hold the springform pan and some water would be fine. I am baking this filling in 2 9 inch graham cracker pie crusts, should I lower the amount of cooking time? I haven’t ever made a cheesecake in a pie crust to know for sure. I would think that they are thinner than the full cheesecake, so yes. If you aren’t planning on using the water bath either, then you’d want to reduce the baking time even more so it doesn’t over bake. Mary, I am doing the same. Can you tell me how long you baked it and at what temp? This looks amazing! I am going to try it out now but only have an 8″ pan..would that work? Do i increase bake time? Thanks! It should be fine. You would want to increase the baking time, but I’ve never made an 8 inch before so I’m not sure by how much exactly. At least 10-20 minutes, I’d think. I think it should be ok as long as the bus isn’t too warm – just be sure to use the full amount of powdered sugar to stabilize it. If you want to be sure, you could try using something like Cool Whip instead. I have a 10 in. Springform pan. How would I adjust the cooking time? I haven’t made a 10 inch before so I’m not entirely sure. You’d probably want to reduce the time by roughly 15 minutes. I’ve made this twice already this season. Both times were hits! Such a great recipe! I’ll be scanning through the rest of the site. Thanks again! I’m so glad to hear you’ve enjoyed it! I don’t have a large enough pan to hold my spring form pan for a water bath!!. Do I have to do one? I’ve made other cheesecakes before that didn’t call for a water bath and it turned out fine. Don’t really want to go to the store at 11 at night. 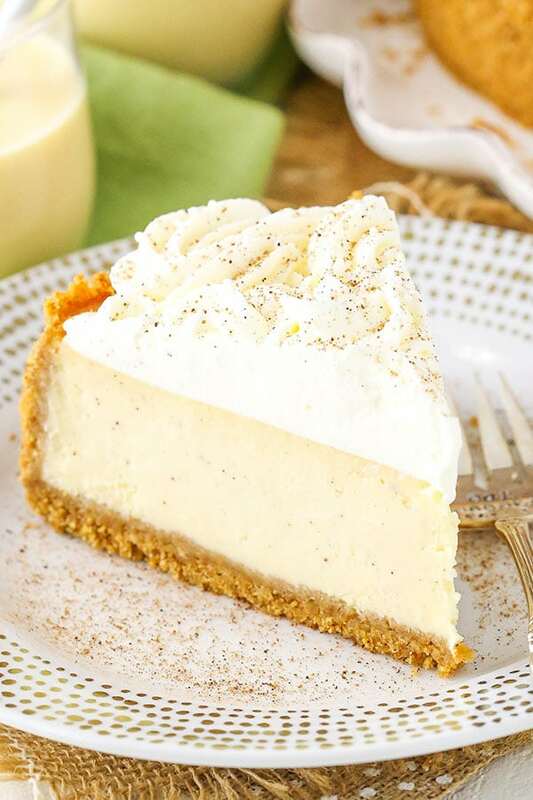 Often without one a cheesecake will brown around the edges, be a little drier, fall in the center while cooling and most likely crack. Not all recipes turn out that way, but many do. I prefer to avoid all of those things, so I use a water bath. You certainly don’t have to though. Not necessarily. You should just refrigerate it and see how much it firms up. It might just be a little softer. Hello, I don’t have a spring pan, so I used a 9 1/1 deep dish pie pan. I made the crust and it fit nice. My question is how long should I bake it ? I won’t be removing it from the pan. Only a piece at a time to serve. So how long should I chill it before applying the topping? I made this today and can’t wait to eat it tomorrow. It is the first cheesecake I have ever made. My brother always made and our sister cheesecakes when visited but he died last year so I wanted to do something to make it seem like he is with us. I am quite impressed that I managed to make it without cracking at all. I do have a new appreciation for all work and time he spent. Making our favorite treat for us! This recipe was delicious, made it for Christmas Eve. The eggnog flavor is there but it’s not overpowering, perfect. The only issue I had is my whipped cream just wasn’t stiff enough to pipe on, I ended up just spreading it on, but it still looked pretty! Thanks for the recipe! I just made this cheesecake for Christmas and couldn’t wait to eat it as I love eggnog. I am an experienced baker and have been baking cheesecakes for years but this one failed and I’m not sure why. I followed the directions exactly and baked it for 1 hour 35 minutes. It sat in the refrigerator overnight. When I cut into it at over half of the cake was extremely underbaked. i have baked many water bath cheesecakes with no issues so I was very disappointed with this one. I have a new oven so I know that wasn’t the issue. At such a low temp it would have had to have baked at least an extra half hour. Any ideas what might have happened? This is the very first cheesecake I have ever made, it was heavenly!!!! The only problem I had was the water bath, it leaked into the cheesecake. I looked at your water bath tips. Next time I make the cheesecake I will use your tip. Thank you for an absolutely wonderful recipe. I made this for the holidays and it was fantastic!!! Not overly sweet but oh soo good! Highly recommend! Worked perfectly! Seriously, this was the hit of the family dinner party. It was absolutely delicious, and turned out just the way I wanted, even at a high altitude! Thank you! Wonderful to hear! Glad you enjoyed it! Thanks Nicole! There is a print button under the picture with the recipe. Here is a link to print as well. I hope this helps! Do u have to use the water bath ? Well, no, it’ll bake without it. But it will likely fall in the middle when it cools, brown around the edges and quite possibly crack. Check out my tutorial for how I set up my water bath, if you like. I just made this cheesecake and the top came out so nicely flat and browned I don’t even want to cover it up with whipped cream! But alas I will, because I cannot say no to whipped cream on my desserts. However, for those who were a little concerned about the longevity of the cream, as extra insurance I will stabilize the whipped cream further with a couple teaspoons of gelatin. I will get maybe 2 1/2 tbsp of cold water and sprinkle on 2 tsp of gelatin; allow the gelatin to absorb and the microwave it until it’s liquid again, it shouldn’t take any longer than 15-20 secs. Then while I’m whipping the cream I’ll pour in this gelatin mixture – this always ensures my whipped cream stays in tip top shape as long as I need it! Thanks for your tips on the whipped cream! Made the eggnog and pumpkin cheesecakes for Thanksgiving, and they were a big hit. The granddaughter loved the eggnog and the son said they pumpkin was better than pie. I have to confess, I liked the eggnog best. I just made this last night. I used two premade Graham cracker pie shells. The recipe amount fit perfectly. Can’t wait to taste them this evening. Thanks. Hi I’m about to make this and was planning on doing 2 pie shells as well. Can you please reply with how long you baked them for? Best cheesecake I have ever eaten!! Even better than The Cheesecake Factory!!! I’m reviewing the recipe and comments before attempting this, my first cheesecake! For a party nevertheless. Anyway my question is with the crockpot liner, why is there still need for foil? Heat maybe? Also, glad I preread the recipe, will need to make it a day early so it will cool. Thank tou. I add aluminum foil for double coverage. If you’d like to see more details on how I often set up my pan to avoid it leaking, check out my tutorial here. I want to make this but do not understand the water bath. If I have a convection bake option on my oven do I still need to use that? I assume its just to keep it from cracking? Convection should circulate the air and minimize that or is there another reason for it. I’d recommend a water bath personally. You’re correct, without a water bath, cheesecakes can easily crack when cooling, sink in the middle when cooling and often brown on the edges. 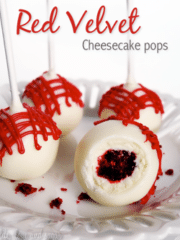 The cheesecake flavor will be the same, but it tends to have a less creamy texture (in my opinion, anyways). If you choose not to use a water bath though, you’ll likely want to reduce the baking time by maybe 15 minutes or so. If you’d like to see how I often set up my pan to avoid it leaking, check out my tutorial here. Thank you, I’ll try the water bath. Argh! I was pouring the warm water into the pan and my daughter startled me and I poured some of it into the cheesecake! Can it still be ok? I think my only saving grace is that I reduced the eggnog by half before adding it, so it’s starting out a bit thicker. Hmm, hopefully it wasn’t too much water. Did it turn out ok? I just made this recipe in my mini cheesecake pans. So cute and delicious. I reduced the eggnog down to thicken it and I baked them at 325° for 18 minutes. I put a pan with hot water on the bottom rack. It made 34 minis. I would post a picture if I could figure out how ☺️. Thank you! Would an orange whipped cream be good on this? I want to diversify the flavors a bit instead of eggnog on eggnog. Hmm, I haven’t ever had those two flavors together, but it could be ok.
Hi Lindsay, I love this receipe. Can it be made in cupcakes? If so, what would the recipe look like? They should be fine made in a cupcake pan. 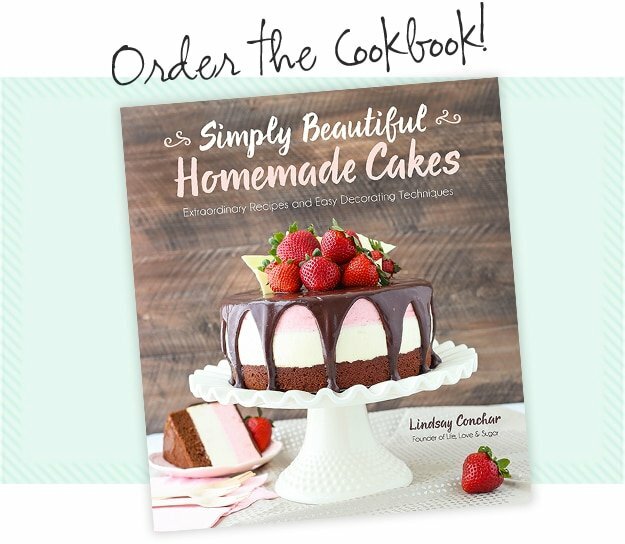 I’d check out this recipe for a guide for baking. If you use the full recipe, you’ll get 24-28 minis. The baking time should be close to what is listed in that recipe, just maybe a few minutes more. Hi! It’s not often I leave a reply but this recipe is so amazing I just have to! I’m going to be honest and say making cheese cake always freaked me out. After making this recipe I have concurred that fear. I followed the recipe exactly the first time I made it. I was concerned if it was baked long enough. I searched on line to find out how to know for sure. I had no idea you could check using a thermometer in the filling. At 150 to 155 degrees it is done. I took it out of the oven at the 1 hour 30 minute mark. It was only at 120 degrees. I put it back in for 10 minutes and checked again. It was 150 degrees. Perfect!???? I turned the oven off and followed the rest of the instructions. Two things I will ALWAYS do when making a cheese cake in a water bath is use the slow cooker liner around the spring form pan then extra wide tin foil (no seams). Every cheese cake I’ve made since has never had any water leaking into the cake, not a single crack, perfect!!. I do a lot of cake decorating and I’d like to share a “trick” for stabilizing the whipped cream. Your recipe calls for so much icing sugar it’s just too sweet in my opinion. If you whip 1 cup of the cream with 2 tbsp icing sugar until almost stiff and then add 1 tbsp instant vanilla pudding powder and whip a bit more it will be stabilized and pipe just like butter cream icing. It holds it shape even when left at room temp. Thank you for this amazing recipe and I hope my tips help???? I’m so glad to hear you enjoyed it! As for the whipped cream – yes the pudding mix would work. It’s the gelatin in the mix that stabilizes it, so regular gelatin would work as well. Can not get the topping to set up? Followed directions even put in fridge. Going to have to use something else! What do you mean by set up? If you are referring to the whipped cream, did you use the full amount of powdered sugar? It stabilizes it. What would you suggest for cooking times in a 4 inch springform pan? I honestly don’t know. I’ve never made a cheesecake that size. If I want to make this gluten free, can I sub cornstarch for the flour in the filling? Hi Lindsay, I have a gas oven and want to make sure the baking time and temperature would be the same. What type of oven did you use? I have an electric oven. How can I make this a lighter texture. 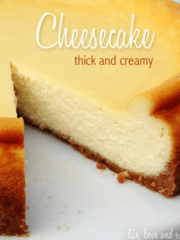 I love eggnog, and am somewhat a fan of cheesecake, but do not enjoy rather thick cheesecakes. Is it possible to make it more frothy like mousse? Hmm, I haven’t tried this, but you could try whipping the egg white part of the eggs and folding those in at the end. It might lighten it up nicely. I’ve made 3 of these cheese cakes in the past week and will be making 2 more for Christmas eve. Rave reviews from all who enjoyed it!! This will be added to my Christmas baking legacy for sure! Wonderful! I’m so glad to hear that! Thanks Pam! Easy to make. Taking to my family Christams Eve party today. I substitued out gluten free vanilla wafers for the crust and GF flour. Beautiful presentation. So glad to hear it! Merry Christmas! So tonight is Christmas Eve, 2018. The eggnog cheesecake is in the oven. So far so good! ??? ?Fingers crossed it turns out. So many good reviews, thought I would try it. It’s a gift for my daughter-in-law…who actually passed your recipe to me to try last year. Finally getting around to it. Merry Christmas from Canada! Aww fun! I hope you all enjoy it! Merry Christmas! I rarely leave reviews for recipes but have to share what i did with this great recipe of yours! I wanted something i could bring to 2 different Christmas gatherings so a full cheesecake wasn’t going to work but I loved the idea of eggnog. I made mini cheesecakes in cupcake tins. I put cupcake liners in the pans, used a gingersnap cookie for a crust. I made the cheesecake filling exactly according to your recipe. It made 26 cheesecakes, I baked at 350 degrees for 30 minutes. I topped with freshly whipped cream and sprinkled nutmeg on top. They were hugely popular!! I’m so glad the minis were such a hit! Merry Christmas! My crust got wet in the water bath. Any suggestions? There’s not a whole lot you can do, but it should be fine. If you take it out of the springform pan and let it sit in the fridge for a bit, it should dry out a little. I will admit that the recipe is a bit time consuming…BUT…it is soooo worth it!!! This is THE best cheesecake I have ever had!!!!!!! I am wondering if it can be made with no eggnog…hence when its not the holidays and how the recipe would need to be modified!!! 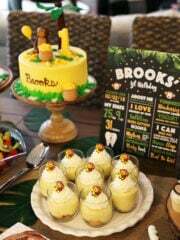 Thank you for such a GREAT holiday desert!!!!!! That’s wonderful to hear! I’m so glad! You can make it without eggnog – just replace it with sour cream. You can see the vanilla cheesecake here, actually. 🙂 Thanks Jolene! Up until now, my go-to recipe always called for 8 more ounces of cream cheese. Besides the baking time, would I need to make any notable changes to this recipe or procedure if I wanted a thicker cake? Or would you recommend sticking with this recipe as is for optimized enjoyment? I would think it’d be fine, though it may make the eggnog flavor a little lighter. I made this cheesecake for the first time and the cheesecake turned out perfect. did not set up like what was shown in the video. I had to pour it on top. I follow the direction to the letter. Any suggestions? It’s hard to know from a distance. But what kind of whipping cream are you using? Is it heavy whipping cream or just heavy cream? The heavy whipping cream would be better because of the higher fat content so it would get thicker. Otherwise I’m really not sure what would cause it to not thicken. I’m so glad you enjoyed it! I truly don’t know why the whipped cream gives some people trouble. It set up fine for me and the person who does my videos, and it’s fairly straight forward, so I’m at a loss. I don’t know if it’s the ingredients or the method where the trouble comes up. I can tell you that HEAVY whipping cream, as opposed to regular whipping cream, is going to be better. And you need to use the full amount of powdered sugar. And whipping on the highest speed is best (and I think a stand mixer makes a thicker whipped cream). But other than that, I really don’t know where the problem comes in. I’m sorry, but I hope maybe that helps! Wonderful! I’m so glad you all enjoyed the cheesecake! Sorry I missed this recipe in 2017, but thank goodness found it now! Have made it twice as it was such a hit. I used the Costco eggnog which is fantastic, and followed the recipe which is unusual for me. We all enjoyed it so much, people had seconds. Very creamy, tasty, rich in flavour. Made a third one and have frozen it in quarters, so hope this works out so we can have that final piece on a cold and snowy night. Thanks for this one, it is a keeper.